Histone Extraction Kit (ab113476) is suitable for a quick isolation of total histone extracts from cells and tissue samples from mammals and other species. The amount of starting material can be as low as 105 cells or 1 mg of tissue. For best results, the cell number should be >106 cells or the tissue amount should be >10 mg.
A total of 100 standard extractions (using 107 cells or 100 mg of tissue per extraction) can be performed with this kit. Yield of the total histone proteins can be up to 0.4 mg per 107 cells or per 100 mg of tissue. The yield may vary depending on the cell or tissue type. Histone purification is most often performed before the analysis of the global levels within a sample of post-translational histone modifications in western blot. Chromatin immunoprecipitation (ChIP) is the most common technique used for the analysis of histone modifications at specific sites within the genome. Use a chromatin extraction kit instead of a histone purification kit for the preparation of samples for ChIP. Asterisk indicate a significant difference between the respective C and R groups: ∗∗ P < 0.01; NS not significant. Data presented as the means ± SE (n = 6 per group). Histones were purified from mouse liver cells using ab113476. Each lane was loaded with 15μg of purified histone. 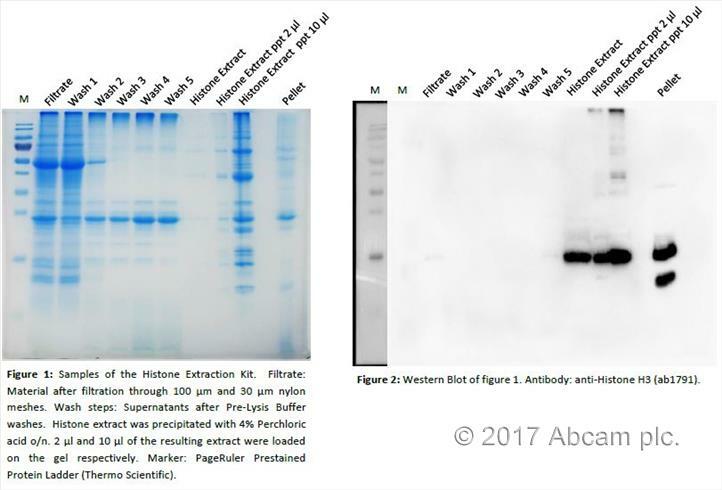 Histone extracts were prepared from MCF-7 cells using the ab113476 and acetyl histone H3-K9 was quantified. Publishing research using ab113476? Please let us know so that we can cite the reference in this datasheet. Please provide centrifugal force values for the RPM specifications in the the protocol. For example, 10k RPM = ? x g.
Does the purified product need to be de-salted before running on a gel? No special preparation such as desalting needs to be done before loading the sample into the gel. Histone Extraction Kit. Mosquito (Aedes spp). This kit worked very well for extracting histones from the pharate larvae of Aedes mosquitoes, Since the pharate larvae are still inside the eggshell, this may have been a difficult sample. To homogenize ~250 larvae (1 mg of eggs), I homogenized with a 1.5 ml plastic pestle in and then used a Biospec Bead Beater (Glen Mills) with Glass Beads (acid washed, 30-40 sieve) for 1.5 minutes. Proceeded with the rest of the protocol with no changes. The Histone Extraction Kit (ab113476) was used to extract histones from adult A. thaliana leaves. 2.5 g leaf material was frozen and ground in liquid N2 and used for the extraction with 8 ml 1x Pre-Lysis Buffer. Two filtration steps through 100 μm and 30 μm nylon meshes and additional Pre-Lysis Buffer wash steps were performed in order to remove residual plant material. The histone extract was precipitated with 4% perchloric acid o/n. The Histone Extraction Kit is easy to use and generally works with A. thaliana leaves. However, the resulting sample contained some unexpected proteins, e.g. chloroplastic proteins, in addition to histones. Our lab used the Histone Extraction Kit (ab113476) to extract histones from brains of the Western honeybee, Apis mellifera. A single brain (approximately 10 mg) was used for each sample. We quantified the histone extracts using absorbance at 280 nm on a NanoDrop 1000 spectrophotometer. Each extraction yielded 20-40 ug of total histone protein. We then used the extracted histones in the Histone H3 Total Acetylation Detection Fast Kit (Fluorometric) (ab131561). The kit is very easy to use and we will use it again in the future. Dear technical support team: Why is so important to use this kit to isolation histone instead to use RIPA buffer? what is the difference? RIPA buffer can be used for extracting nuclear proteins but ab113476 is specifically for histone proteins. In general, the isolated histone protein concentration is much higher with use of ab113476than with RIPA buffer. The EpiSeeker Histone Extraction kit was used to isolate histone proteins for use with the EpiSeeker Histone H3 Total Acetylation Detection Fast Kit. Histones were extracted pupae of the flesh fly, Sarcophaga bullata, which is a non-model insect. The kit was easy and fast to use. It was easy to scale the reaction size to the amount of tissue. This kit was used to isolate histones from pupae of the fleshy fly, Sarcophaga bullata, a non-model insect. A single pupa, weighing approximately 100 mg, was used in each sample. Each extraction yielded 14-19 ug/ul of histone protein. The kit was easy to use and simple to scale to the size of my insects. The extracted histones worked well with the EipSeeker Histone H3 Total Acetylation Detection Fast Kit. Does this kit contain HDAC inhibitors? ab113476 does not contain any HDAC inhibitors. I am interested in H1 histone extraction from human blood and skin and had problems with an in-house acid extraction protocol. I wonder how the EpiSeeker histone extraction kit performs on H1. Would it be able to extract H1 quantitatively from these tissues? I can confirm that ab113476: EpiSeeker Histone Extraction Kit would be suitable to use for human blood and skin and would extract total histone proteins, including H1, that would be quantifiable. If I stored the cell pellets at -80oC, will the sample still be suitable for extracting nuclear protein and histone protein using the nuclear extraction kit (ab113474) and histone extraction kit (ab113476) respectively? Nuclear Protein extraction and Histone protein extraction from cell samples frozen at -80oC could still work using ab113474 and ab113476. However, the enzyme activity of nuclear extracts from frozen tissues may be much lower than that from fresh tissues.